Fort Meade, Florida, located in Polk County, was a post that served as the headquarters of the military forces of the area when it was established in December 1849. The fort was built on the Peace River along a new military road from Fort Brooke to Fort Pierce. The road and the fort were constructed by Lieutenant George Meade directing nine companies of the 1st U.S. Artillery, the 3rd U.S. Infantry, the 4th U.S. Infantry, and the 7th U.S. Infantry. When it was complete, the post was named for Lieutenant Meade, who would later rise the rank of Major General during the Civil War. The post was garrisoned by U.S. Army and Florida Mounted Volunteers. Future Confederate General Stonewall Jackson was stationed at the fort in 1851. The post was abandoned in November 1854, reoccupied in March 1857 and again abandoned in September 1857. It was occupied by Confederate forces from 1861 to 1864 during the Civil War. 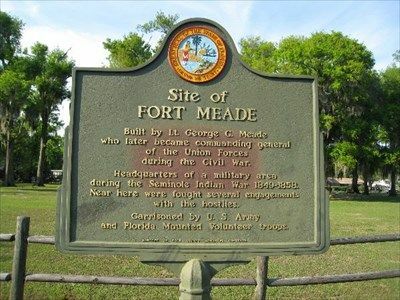 The town of Fort Meade, which had grown up around the fort, was destroyed by Union forces in the Battle of Bowlegs Creek in 1864. Afterward, the town was rebuilt. There are no remains of the post but a historic marker designates the site in Heritage Park on 3rd Street N.E., 500 block, in Fort Meade, Florida.